The argument between adding a lower difficulty setting in Souls games can basically be boiled down to accessibility vs. the “Git Gud” mentality. These videos address both sides. This entry was posted in Gaming, Video Games and tagged Dark Souls, Dark Souls 3, Git Gud, Hidetaka Miyazaki, Jim Sterling, Souls Series, Video Games on April 29, 2016 by Mike Gonthier. Praise the Sun for Dark Souls 3!!! The intro cinematic for the long awaited Dark Souls 3 released last week, and it does not disappoint. During the network test it became apparent that Dark Souls 3 was drawing more inspiration from the original Dark Souls. It seems that trend has continued into the opening cutscene of the game. The cutscene reveals several bosses from the game and provides a bit of lore into the new setting of the game, Lothric. It mirrors the opening of the original Dark Souls and features the same narrator Pik Sen Lim. The similarities don’t stop there. Two of the three bosses shown in the trailer are inspired by previous installments of the franchise. Farron’s Undead Legion are called the “Abyss Watchers.” No doubt a nod to Dark Souls fan favorite Artorias the “Abysswalker.” The Watchers are also wielding replicas of Artorias’s greatsword. The last boss depicted is Yhorm the giant. He wears a crown similar to that of the faceless Giant Lord of Dark Souls 2. Giants typically wield axes, but the Giant Lord wields a greatsword. Yhorm wields a blade that looks like a large cleaver. The trailer also shows us the image of a mountain top with what appears to be ruins of some sort. Fans of the Souls series will immediately recognize it as another Firelink Shrine, the sort of hub area of Dark Souls. This area is tended by the Bonfire Keeper. A woman who wears a crown that covers her eyes, similar to the Maiden in Black from Demon Souls who has solidified candle wax over her eyes. The final similarity is that each revealed boss is said to be a “Lord of Cinder.” According to the lore of the Dark Souls franchise, a Lord of Cinder is someone who sacrifices their soul to link the flame. Gwyn, the final boss of Dark Souls is a known as the Lord of Cinder. However in Dark Souls 3 every boss in the trailer is referred to as a Lord of Cinder. Your character appears to have revived along with these Lords of Cinder. Perhaps you yourself are one as well. Dark Souls 3 releases April 12th, 2016 and is available for preorder now. Not that you should preorder games, because why on earth would you pay for a game that you can’t play immediately. 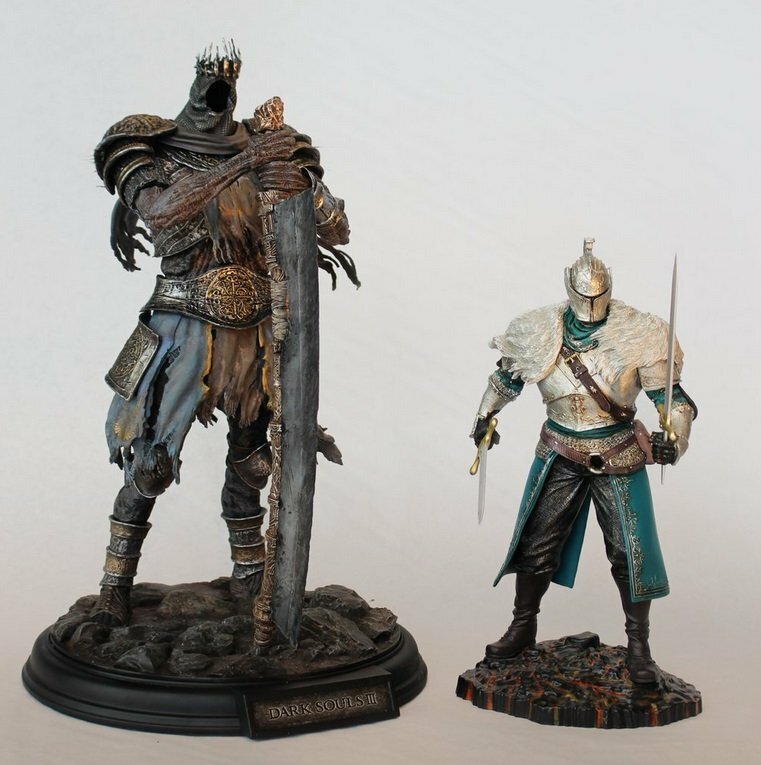 However the Deluxe edition comes with a really awesome figure of the new Red Knight enemy and the Prestige edition comes with a Yhorm figure as well. This entry was posted in Video Games and tagged Dark Souls, Dark Souls 3, Dark Souls III, Hidetaka Miyazaki, Souls Series on February 16, 2016 by Mike Gonthier.